In Italian Arancini mean “Little Oranges”. 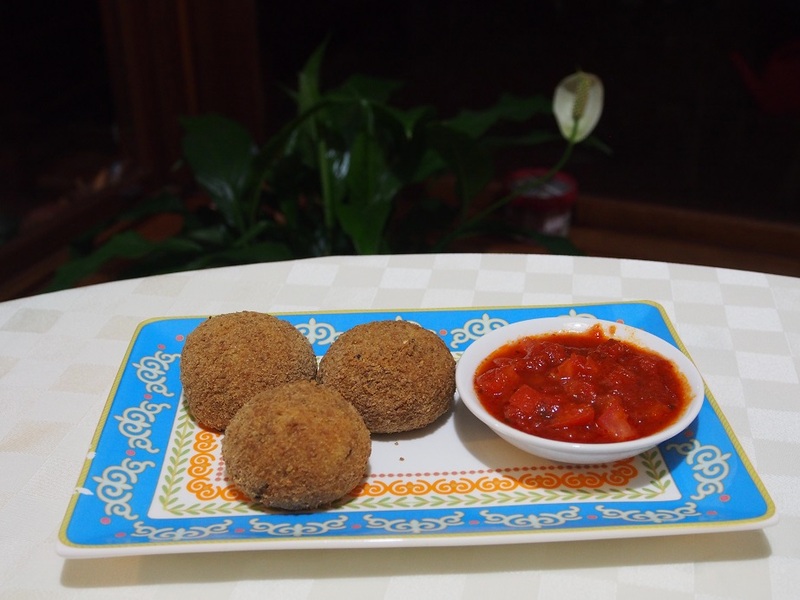 Although, in some regions of Italy Arancini have conical shape, and in others – they are called just “Rice Balls”. I love Arancini, and the results of experimenting with Quinoa are below. 1. Cook Quinoa as instructed on the package. 2. Place the brown rice flour and flaxmeal on two separate plates. Lightly beat an egg in a cereal bowl. 3. Finely grate the Pecorino cheese and finely dice the mushrooms. Combine and mix well with minced garlic. 4. Add the cheese mixture to quinoa and mix until well combined. 5. Divide this arancini mixture into 12 parts. Insert a piece of Pecorino cheese inside each part, and roll into a ball using your palms. 6. Roll each ball sequentially into the brown rice flour, egg, and then the flaxmeal. 7. Spray arancini with oil and bake at 180C for 20 minutes, or until golden and crispy.